Magna Tyres Group has decided to expand its global presence by venturing into the North American market. The company has decided to begin its expansion into this market by setting up an office in Canada and subsequently expanding its presence with a network of offices and distribution in the United States and Canada. Michael de Ruijter, the CEO of Magna Tyres Group said that the company decided to choose its location for its office in Vaughan, Ontario after careful consideration. He said that the new office will further reinforce the company’s commitment to all of its customers in the region and will offer more opportunities for close daily cooperation. This expansion is driven by the company’s rapid growth in recent years so that it can provide its customers with local support on a 24/7 basis. The move is expected to increase product availability as stocks will be maintained on a local basis. Magna’s clients will benefit from closer and more personalized attention. Magna’s goals with this expansion is to achieve better customer relationships, a higher market share and to increase customer satisfaction levels in this market that offers immense scope for growth. The new office will be helmed by Alex Vitale, who has been appointed as the general manager. The company described Vitale as “an accomplished leader with 20 years of experience in general management, sales and marketing in the tire industry for some of the major A-Brands”. He has profound knowledge of international business and broad knowledge of the tire business. 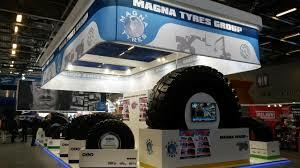 Over the years, Magna Tyres has evolved from a specialist producer of rubber compounds into a manufacturer and distributor of OTR, industrial, port handling, agriculture and truck tires which has a dozen sales offices across the globe. The company makes its tires at its factory in Hardenberg, Netherlands, factory and also sources them from a manufacturing partner in Thailand. Magna’s tires are distributed in over 130 countries.